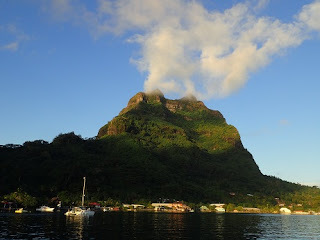 Galley Wench Tales: Bora Bora - Beautiful or Overblown? 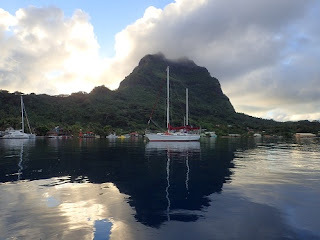 We blew in to legendary Bora Bora with a 25 knot headwind on our nose and gratefully accepted a mooring ball at the amazingly affordable MaiKai Marina. Normally, we anchor, but much of Bora Bora's lagoons are over 80 feet deep -- too deep for us to feel comfortable -- or dangerously shallow and dotted with boat--eating coral heads. 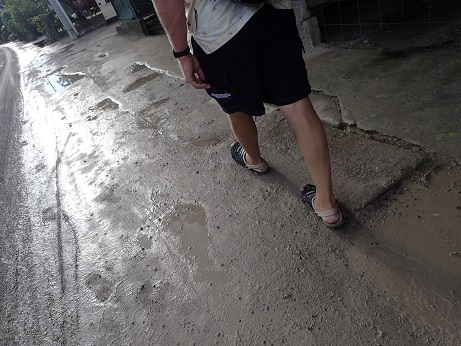 Muddy road of Bora Bora's big town of Viatape. No sidewalks. This is the "dry season." 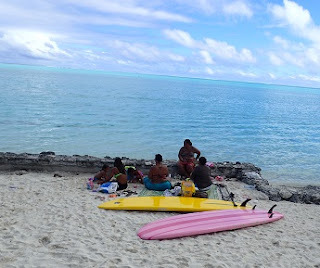 Locals and tourist alike dot \Bora Bora's Matira Beach. Nice but not any more special than Bahamas or BVI beaches. Bora Bora is wet -- not quite what we'd seen in postcards! Everything* was more expensive, more than Galapagos, Tahiti, Marquesas, Moorea (though for $50/week for a well maintained mooring ball is a killer deal in our book - Mai Kai Marina is a notable exception). The paved roads were in the worst shape we've seen on any island., though we suspect it's because they're laying pipe under the road and will then repave. We saw more garbage here than we've seen anywhere since Panama. Community buses are all over but reserved for cruise ship passengers and school children though we've seen plenty of those busses empty. This overlook on Bora Bora was only about 100 yards from the view below. This is by far the best view we saw on our island scooter circumnavigation. We hear the view from the motus which form the outside of Bora Bora's lagoon are more spectacular. - it rained shortly after. Scooters were $64 for 4 hours; it was $35 on Huahine and $64 for 24 hours on Moorea. A SCUBA tank fill from Top Dive was quoted at $30; it was $5-10 every place else we asked. The same pareos selling for $20 at Tahiti's market place were $27-29 in Bora Bora. Boa Bora's MaiKai Marina - only $50 for a week! We've heard great reports on hanging out on the other side of Bora Bora, away from the main island, on the motu side of Bora Bora's lagoon ringing the entire island. 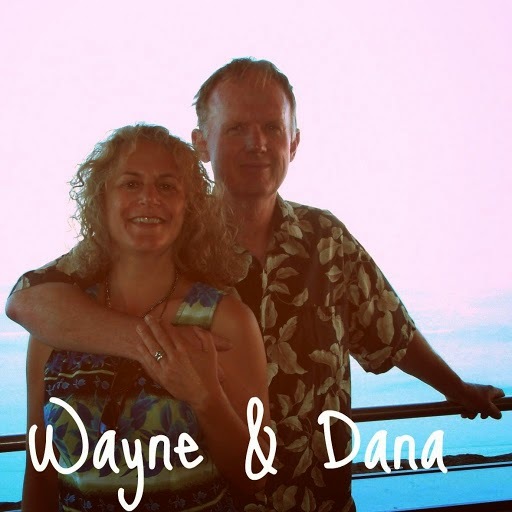 Beautiful coral, colorful tropical fish and leaping manta rays. Sadly, we were more concerned about getting our ducks in a row before we set out for our next passages, without wifi and with a chance to set up a drop of U.S. internet ordered products in American Samoa. Still, we do find it strange that the Bloody Mary Bar makes Trip Advisor's top 5 Bora Bora picks. Just not our kinda island. By the time this posts we expect to be in Maupiti, 30 miles outside Bora Bora French Polynesia. Then it's on to Tonga with a stop in American Samoa and potentially Cook's Suwarrow on the way. 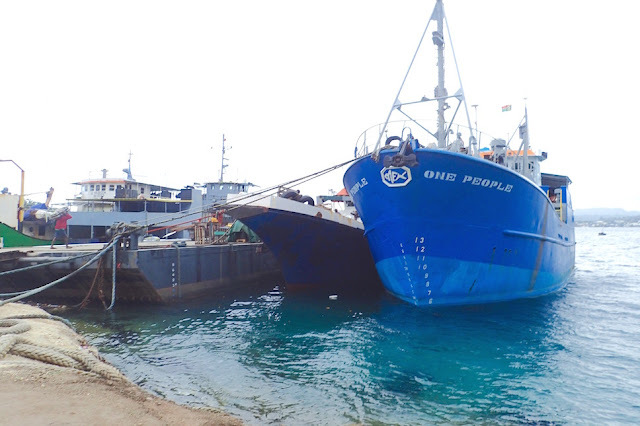 Will set several catch-up blog posts to run while we're on passage, internet permitting. 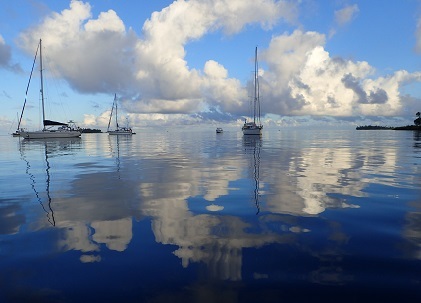 Our Mai Kai marina mooring ball was at S16.20.995 W151.45.388.